On the evening of the 28th of June, 1863, the Third Corps of the Army of the Potomac commanded by Major General Daniel Sickles rested on the road between Walkersville and Woodsboro. To the south on the same road near Ceresville was camped the Twelfth Union Corp under the command of Major General Henry Slocum. At four o'clock on the morning of the 29th of June these Federal Corps were put in motion to the north toward Taneytown. Joining the advancing column ahead of the Twelfth Corp was the Union Artillery Reserve under the command of Brigadier General Robert O. Tyler. At 8:00 am the headquarters train of the newly promoted commander of the Army of the Potomac Major General George G. Meade and his staff joined the northbound column. 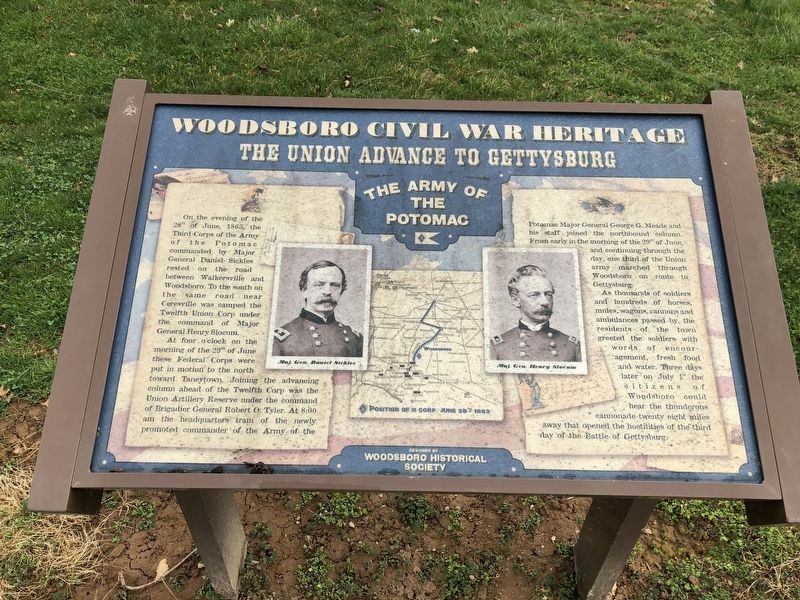 From early in the morning of the 29th of June, and continuing through the day, one third of the Union army marched through Woodsboro on route to Gettysburg. could hear the thunderous cannonade twenty eight miles away that opened the hostilities of the third day of the Battle of Gettysburg. Erected by Woodsboro Historical Society. Location. 39° 31.941′ N, 77° 18.548′ W. Marker is in Woodsboro, Maryland, in Frederick County. 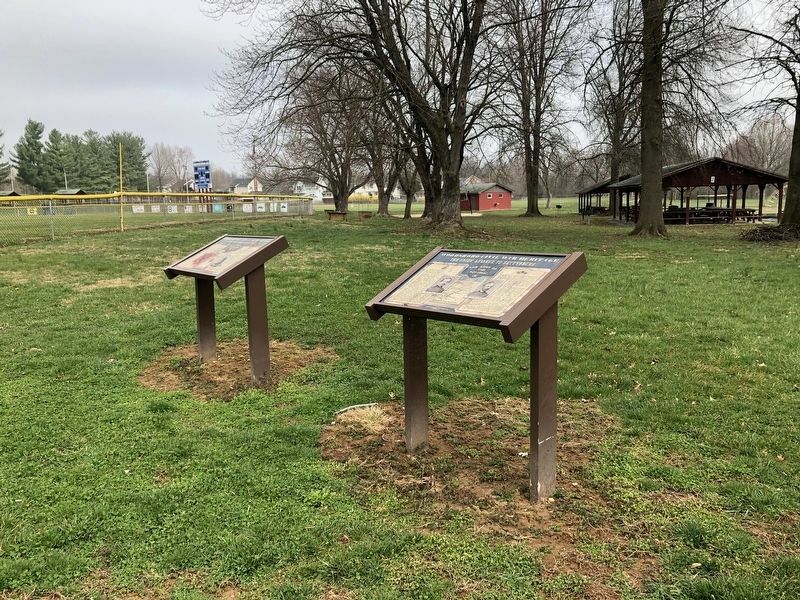 Marker can be reached from Council Drive north of Woodsboro Road (Maryland Route 550), on the left when traveling north. Touch for map. Marker is at or near this postal address: 1 Council Drive, Woodsboro MD 21798, United States of America. Touch for directions. Other nearby markers. At least 8 other markers are within 5 miles of this marker, measured as the crow flies. Stuart's Horse Raid of 1862 (here, next to this marker); George Washington (approx. 2.3 miles away); George Poe (approx. 3 miles away); Israel's Creek (approx. 3 miles away); Grinder/Slaker Shed (approx. 5 miles away); Boiler House (approx. 5 miles away); Chemistry in the Kiln (approx. 5 miles away); Atop the Kilns (approx. 5 miles away). More. Search the internet for The Union Advance to Gettysburg. Credits. This page was last revised on April 6, 2019. This page originally submitted on April 6, 2019, by Devry Becker Jones of Washington, District of Columbia. This page has been viewed 54 times since then. Photos: 1, 2. submitted on April 6, 2019, by Devry Becker Jones of Washington, District of Columbia.